Yorkshire-based commercial property development and investment company, Eshton, has announced plans for phase 2 of its successful Burnley Bridge scheme, with an additional 10 acres secured for 110,000 sq ft of industrial and warehousing accommodation. Just two speculative units totalling 12,500 sq ft remain at the original 70-acre Burnley Bridge site, which is located at Junction 9 of the M65 and was launched by Sir Vince Cable in February 2014. Eshton recently completed a deal for a final 92,000 sq ft design & build unit at the £50m site following handover of the project’s largest building, a 543,620 sq ft unit, to high profile occupier, Exertis. The 10-acre ‘Titanium Park’ site adjoins the existing development to the north and will provide a mix of warehousing and industrial accommodation similar to the existing business park, with a flexible range of high quality accommodation tailored to meet the needs of occupiers. Plans approved are for seven units ranging from 3,000 sq ft to 57,500 sq ft, yet Eshton will ensure that accommodation will be developed to occupier requirements. 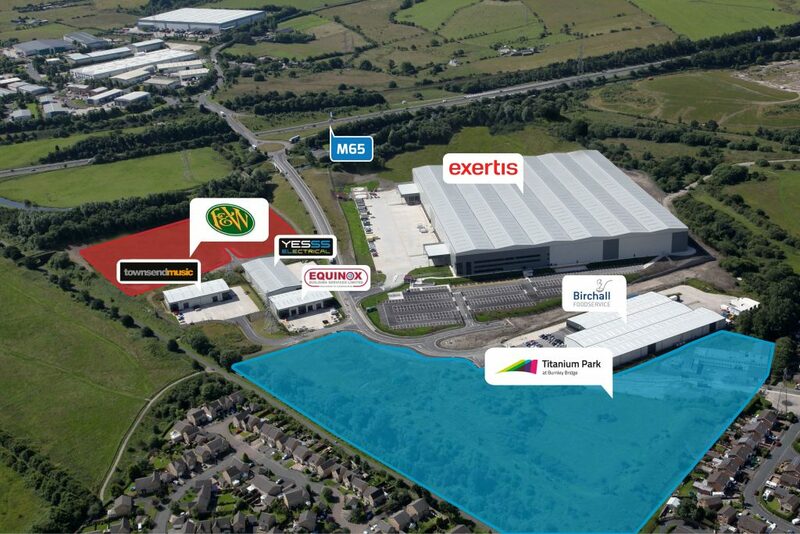 Part of Eshton’s ongoing commitment to investing in Burnley, Titanium Park will bring the total accommodation figure to more than 868,720 sq ft.
James Chapman, managing director of Eshton, commented: “Burnley has a rich industrial heritage and an excellent workforce for current and future occupiers. Titanium Park will be accessible directly from the M65 and Bilfinger GVA and Trevor Dawson have been appointed as joint agents for the site. Kate Ingram from Burnley Borough Council adds: “Eshton’s new plans to extend BBBP are great news for Burnley, providing opportunities for inward investment, business growth and employment.